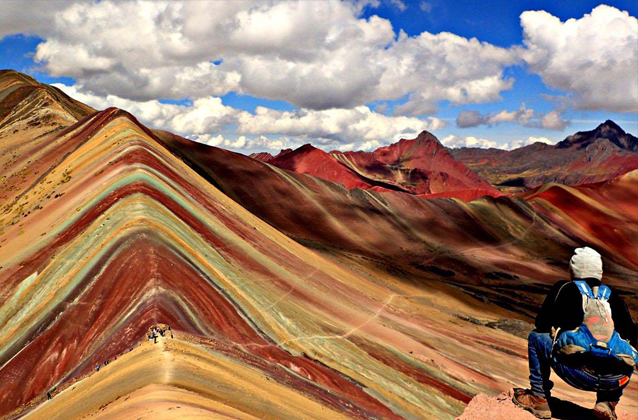 We will pick you up at 3:40am and we will travel for a few hours from Cusco through the rugged mountain countryside of Peru to reach the aptly named Rainbow Mountain, striped with colorful mineral deposits and located far off the beaten path. Hike with a guide to the summit for a once-in-a-lifetime adventure, or rent a horse (own expense) for easier access to the same incredible views. From Cusco, we will drive through Peru’s rugged mountain landscape for a few hours until reaching the town of Quessiuno, where you will eat breakfast before starting your hike. Trek uphill for roughly three to four hours, taking in the colorful views of the Rainbow Mountains. Learn about the local flora and fauna from your guide as you go. Once reaching the peak of the mountain, take time to enjoy the view of the mountain and the snow-capped Ausangate beyond. Then, make your way downhill and eat a leisurely lunch back in town. Return to Cusco is approximately 7 p.m. You will get dropped off at the Regocijo Square, one block from Cusco’s central plaza. This rainbow mountain tour is recommended for those in strong physical shape who have acclimated to the altitude. It is also possible to rent a horse (own expense) if you don’t wish to hike. This is a challenging day of hiking. Hikers should be reasonably fit, and spend some time in Cusco to acclimate (we recommend 3 days in Cusco or similar elevation). The hike takes place over 4500m (15,000ft) and is about 15 kilometers in length (9.3 miles) in total length, with an elevation gain of 685m (2250ft). The main reason this trek is difficult is because of the elevation. The terrain is a gradual climb and you are walking in a wide valley for the majority of the trek. The Rainbow Mountain Tour departs daily and it is available year round. The months of January, February and March are in the wet season, please bring a good rain jacket and waterproof your belongings.